Welcome to Ironwood Michigan! Ironwood is a community of ripe opportunity for entrepreneurs, developers, and businesses. We have an easy regulatory framework along with incentives, and financial assistance for businesses and people looking to invest in Ironwood. We have a dedicated Community Development Department that directs our Ironwood Economic Development Corporation and Downtown Ironwood Development Authority which is made up of businesses and entrepreneurs from diverse backgrounds. Make Ironwood your home and Find Your North! The Michigan Economic Development Corporation (MEDC) is providing the City of Ironwood an amazing site selection resource at no cost. Michigan’s interactive property database, powered by GIS Planning, the Commercial Board of Realtors (CBOR) and the Commercial Alliance of Realtors, West Michigan (CARWM), contains over 20,000 commercial listings (Surrounding Area Properties). It provides Michigan commercial realtors, economic development professionals, and national site selectors with property, demographic, and labor force information. The state-of-the-art mapping component produces customized maps and reports using the most up to date information within the application. The program has the ability to give you and the City of Ironwood a strong advantage in making your sites and buildings available to anyone with an internet connection. Furthermore, the program provides you with another channel to get the word out about available properties. The program allows you to be extremely detailed about which property-related information you’d like to display within your listing. Coupled with the GIS-enhanced search features, the program is an easy way to extend the reach of your commercial site selection advertising to a larger scale, while providing site selectors with an inclusive look into the property and community in which they are looking at investing in. Real estate professional or private owner contact information will be prominently displayed on each listing so that a site selectee can contact you directly from the listing. To have your building or site listed please use the following form and submit your request to Tom Bergman or call with questions at 906-932-5050 ext. 126. One component of the City’s economic development efforts involves business attraction. The City has prepared a Community Profile that is uses to attract new business and talent to the community. We also have a Business Assistance Flyer that outlines various resource available to businesses looking to start or grow. For businesses looking to locate in Ironwood see the Business Incentives Flyer. Many communities focus economic development activities on attracting new businesses; albeit important, another component of economic development is retention of existing businesses, as they already have an invested interest in the community and are important to the strength and character of a community and its economy. This program has been established based on economic development practices, observations of the community as well as recommendations from the City’s comprehensive plan. The City has been broken up into Economic Development Zones. Each member from the Downtown Ironwood Development Authority, Ironwood Economic Development Corporation and the Ironwood Industrial Development Corporation has been assigned a zone. Each member is responsible for carrying out the program for their zone. Each member will meet with each owner/manager of each business in their zone at least once per year. The purpose of these meetings is to learn more about your business and how the City can assist your business. The visits will also allow members to inform you about current programs and assistance available through the City’s website. Data collected as part of these visits will assist the City with assisting you in the following ways. *Stronger relationships between the City and the business community. *Provides emergency contact information to assist you in the case of an emergency. *Assists the City with understanding the operations of your business in order to determine if there are any opportunities available for your business through the form of business, economic and/or financial assistance and makes your business eligible for assistance programs. *Allows you to list commercial/industrial properties for sale/lease through the City’s on-line site selector/real estate finder program at no cost. *You will receive informational emails regarding business programs and events. In 2014 the City Commission designated $2,500 towards the City’s first local facade improvement program based on Strategy 6.3(a) of its Comprehensive Plan through the support of the Downtown Ironwood Development Authority (DIDA). The façade program is structured to provide downtown commercial buildings façade improvements that create a high impact visual and minimize deterioration. This program is based on the premise that the exterior improvements will stimulate additional private investment in the buildings and surrounding area, and attract additional customers, thereby resulting in additional economic opportunities. 1. The program will provide a 1:1 match for up to four(4) buildings for facade improvements. The City has approximately $2,000 to fund projects with. 2. The program is a reimbursement program which means the property owner must complete the project and submit invoices and pass inspection by the City Building Inspector in order to receive reimbursement. 3. A building permit is required but there will be no charge. 4. All work shall be completed and reimbursements submitted by September 2, 2016. 1. Property is zoned C-2 Downtown Commercial District. 2. Building is used for commercial purposes. 3. Applicant must be the owner of the building. In additon basic contact information required in the application a minimum of two (2) cost estimates will be required and photos of the building with proposed improvements drawn on. Permanent exterior improvements including masonry repairs and tuck-pointing, painting, residing; repair/replace/preserve historically significant architectural details; removal of historically inappropriate materials; window/door restoration/replacement; storefront reconstruction; cornice repair, awnings etc. Facades that face a public street shall take first preference, facades that do not face a public street but are visible from a public street will be given consideration depending on the level of deterioration and need for improvements. Roof repairs; attached, hanging, or projecting signs unrelated to the architecture of the building; interior improvements and furnishings; utility/trash enclosures; parking lots and site improvements. A group comprised of the Community Development Director, Building Inspector, DIDA Chair and a member of the Ironwood Historical Society will review and select the projects. Applications will be scored based on how high impact of a project it is visually (historic accuracy will be taken into consideration) as well as the cost ratio of building owner contribution to the grant received (the greater owner match the better it will score). A revolving loan fund (RLF) is a source of money from which loans are made to businesses that generally don’t qualify for traditional financing. The revolving loan fund is able to grow and provide more money to more businesses as principle and interest are paid back on existing loans while encouraging economic growth and community revitalization efforts. The City of Ironwood is able to loan out money to businesses that are not able to acquire traditional financing for purchase of equipment, working capital and construction. For every $20,000 loaned out one full time equivalent job must be created and 51% of those jobs must be of low to moderate income. Prior to requesting RLF funding from the City applicants must have a business plan in place. If you need assistance with preparing a business plan contact Tom Bergman, Community Development Director or view available resources to assist you. Once you have a business plan please contact Tom Bergman, Community Development Director, to discuss the loan process. The City partner’s with Northern Initiative to administer the loan approval process and you will work closely with them. Northern Initiatives is a Community Development Financial Institution. They provide loans and business services to small business owners and entrepreneurs who create jobs and enable the communities in our region to thrive. In addition to managing the RLF, Northern Initiatives offers a variety of loan products for start-up and existing businesses. 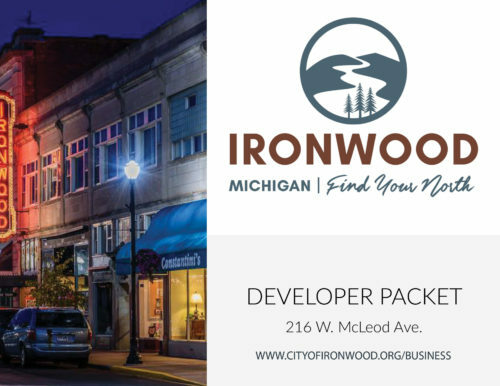 In 1984 the City and its Economic Development Corporation (EDC) received a Michigan Small Cities Community Development Block Grant (CDBG) to assist Ironwood Plastics, Inc. with an expansion project. The City was able to grow its RLF from the Ironwood Plastics, Inc. project from lease payments on a $150,000 addition to the industrial building and payments on a $100,000 loan for machinery and equipment. The RLF program is a federal program through the U. S. Department of Housing and Urban Development (HUD) which is administered by each state. In Michigan, the Michigan Economic Development Corporation (MEDC) administers the program down through local units of government, which in Ironwood’s case is the Economic Development Corporation. Prior to 2013, the City of Ironwood administered the RLF program. In 2013 the MEDC proposed to regionalize the RLF. The MEDC selected regional fund managers to administer the program for various regions in Michigan; the Upper Peninsula is one region and is now managed by Northern Initiatives (NI) out of Marquette, MI. In 2013 the City of Ironwood decided to regionalize its RLF by signing an agreement between the City, MEDC and NI for administration of the RLF by NI. The City decided to regionalize in order to have access to more funds, more flexibility in the program, additional leveraging options, the services of an expert in lending practices and elimination of federal requirements as repaid funds will be de-federalized. Prior to conducting any building improvements, construction/development of property, or opening or expansion of a business please check with the Community Development and Building Departments to determine if permits are requried. The following require approvals and permits. 1. Business Licenses are required for all businesses conducting business in the City of Ironwood. Please submit the following Application to the City Clerk’s Office. 2. Building Permits may be required depending on the construction activities. Please contact the Building Department to determine if a permit is required. Prior to issuance of a building permit approvals from the Planning Commission may be required as outlined below. 3. Planning Commission. The following Planning Commission approvals are required prior to proceeding with construction/development of property. Please contact the Community Development Department to determine if your project requires approval. Requirements can be found in the Zoning Ordinance. Prior to submitting a Zoning Application, please contact the Community Development Department to discuss your project and the application process. 4. Zoning Board of Appeals. If a variance or appeal is required requirements can be found in the Zoning Ordinance. Prior to submitting a Zoning Application, please contact the Community Development Department to discuss your project and the application process. Contact Jim Beauchamp at 906-280-1754.